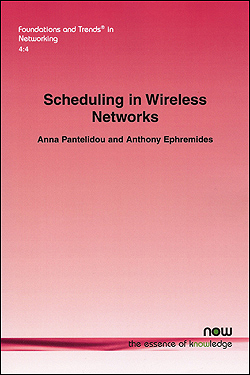 Scheduling in Wireless Networks is a new book co-authored by Professor Tony Ephremides (ECE/ISR) and alumna Anna Pantelidou (EE Ph.D. 2009), now a principal researcher at the Systems Research and Standardization of Modem Technology unit at Renesas Mobile Europe Ltd. The book is published by now Publishers Inc. and was originally published as volume 4, issue 4 of Foundations and Trends in Networking. The book provides a reference point for the rich set of problems that arise in the allocation of resources in modern and future networks. It reviews the problem of scheduled channel access in wireless networks with emphasis on ad hoc and sensor networks as opposed to WiFi, cellular, and infrastructure-based networks. After a brief introduction and problem definition, it examines in detail specific instances of the scheduling problem. These instances differ from each other in a number of ways, including the detailed network model and the objective function or performance criteria. They all share the "layerless" viewpoint that connects the access problem with the physical layer and, occasionally, with the routing layer.